'I'm chasing monkeys round the garden with a meat cleaver as we speak,' I wrote on my Facebook page as I was busy making this dipping sauce. But of course that was a lie. I was frying onions and combining them with ketchup, Worcestershire sauce, chutney and all the piquant relishes that go into making this South African steakhouse classic. This sauce has a disgusting name, and I have always found restaurant versions of it vile. But I could not leave this iconic South African recipe out of my series of my series of delicious, easy football snacks with a South African flavour, so here it is. Let's get the name out of the way first. There are many theories about why this sauce has such a grisly name, many of them involving French chefs and Johannesburg's old Carlton Hotel. After having read many of these theories, I reckon Eric Bolsmann, writing in The Times, has the most plausible explanation. But enough of monkey testicles. Bolsmann gives Bagatta's original, rather elegant recipe for the sauce in his article, and it contains neither chutney nor tomato sauce, nor garlic, soy sauce, sugar, wine, port or the many other ingredients that you will find in dozens of 'classic' monkey-gland sauce recipes. 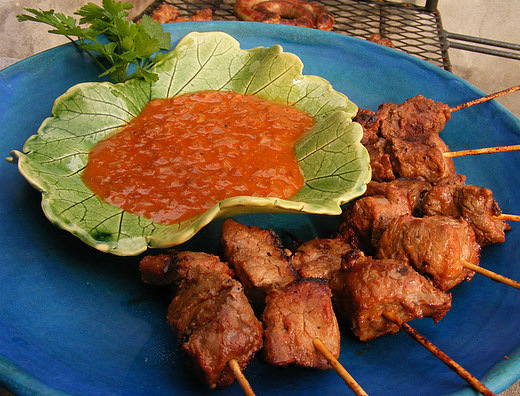 This, in its many variations, is a basic barbeque sauce, and can be as piquant and spicy as your tastebuds demand. This may be a brash and - dare I say - somewhat trashy concoction, but it is part of South Africa's culinary landscape, and its fans do not appreciate any sort of derision, as you will see if you read these comments. If you can't find a braai [barbeque] to cook these on, place them under a blazing hot oven grill. Do use well-hung, mature rump steak or fillet steak so you end up with chunks of beef as tender as a monkey's wrinkled ... oh, never mind. Cut the steak into large cubes and place in a bowl. Combine all the marinade ingredients, pour over the beef cubes and toss well to combine. Cover and set aside for an hour or two. To make the sauce, heat the oil in a large frying pan and fry the onions over a brisk heat for a few minutes, or until beginning to turn golden. Add the garlic and ginger and cook for another minute, without allowing the garlic to brown. Now add the white wine and allow to bubble until almost all the wine has evaporated. Stir in the tomato sauce, chutney, Worcestershire sauce and chilli powder. Cook, over a low heat, for five minutes, or until you have a thick, glossy paste. Stir in the water and the coconut cream and simmer for another three minutes. Season with plenty of pepper and add a little salt, if necessary. At this point, you can purée the sauce using a stick blender; I think it's nicer when it's chunky. Cover the sauce and set aside until you need it. Fire up a braai or barbeque (or preheat the oven grill to its maximum setting). Remove the steak from its marinade and thread it, two or three pieces at a time, onto slim satay sticks that have been soaked in cold water for 15 minutes. Cook the kebabs over medium-hot coals for 6-10 minutes - turning frequently and basting with any remaining marinade - or until nicely crusted on the outside, and just pink within. In the meantime, warm the dipping sauce. Serve immediately. Interesting you mention the name Bagatta,I am pretty sure that there was a Bagatta Family involved with Hildebrands in the 50s and 60s. Old Carlton Hotel gave us a lot of good restaurateurs. Mr Gabbani of Hildebrands was on of the finest table attendants I ever experienced.